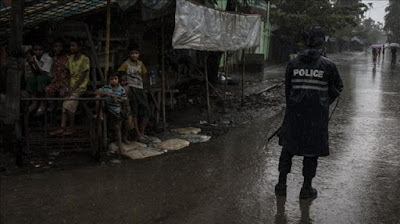 YANGON, Myanmar: A delegation of 10 EU officials arrived in a part of Myanmar wracked by alleged atrocities committed by security forces against Rohingya Muslims in recent months. The ten-strong group, led by Colin Steinbach, political head of the EU office in Yangon, arrived in Maungdaw, a town in Rahkine state bordering Bangladesh, for a three-day visit. State government spokesman Tin Maung Swe said the officials would meet figures from the state authorities, political parties and local communities. “They arrived in Maungdaw today and will be back in state capital Sittwe on Friday,” he told Anadolu Agency by telephone. The group arrived in Sittwe on Tuesday, where they met senior officials and the deputy speaker of regional parliament. Tens of thousands of people have fled Rakhine since the military began a clearance operation last October following the deaths of nine police officers in attacks on border posts. During the operation, the UN and rights groups have documented widespread abuses by security forces such as killings -- including of children and babies -- gang rapes, brutal beatings, the burning of villages and disappearances. The government has said at least 106 people were killed during the operation but Rohingya groups have said around 400 Rohingya were killed. The UN Human Rights Council decided last week to send a fact-finding mission to Myanmar to investigate alleged violations. However, the government rebuffed the UN decision, claiming the mission would inflame the situation. A group of 20 local and foreign journalists is also visiting Maungtaw, state-run newspapers said Wednesday. The district had been off-limits to journalists and rights activists during the crackdown.